In recent years, a wide range of neural differentiation protocols for human embryonic and induced pluripotent stem cells have been published . There is substantial interest in the scientific community to use these cells to study basic mechanisms of brain development, neuronal function, and drug-induced effects. Conventional monolayer differentiation protocols are well suited for large-scale screenings because they are easily scalable and provide a high degree of cell homogeneity. 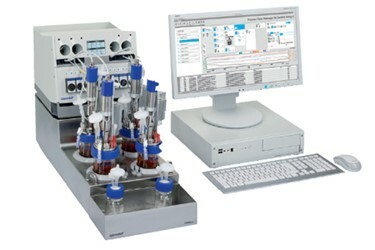 Nevertheless, there are several limitations of 2D cell culture systems, mainly due to their limited complexity. To overcome these limitations, protocols for in vitro brain organoid generation were developed. They allow generation of highly structured organoids consisting of multiple regions with distinct features of different regions of the central nervous system . These systems can be kept in culture for up to 20 months  and show a remarkable degree of maturation, which makes them promising models for studying the development of the human brain. On the downside, there is a high degree of inter-organoid heterogeneity caused by stochastic effects during the initial formation of the organoids. Furthermore, production of these models requires a considerable amount of manual lab work, which limits their scalability. These factors make current organoid technologies unsuitable for the development of standardized models or assays. Using bioreactors that allow tight regulation of process parameters improves homogeneity of neural spheroid cultures [4,5] and allows scale-up to produce sufficient cell numbers for novel pharmacological testing devices such as Multi-Organ Chip systems .